Mountain Views to the back, Sea Views to the front – PRICELESS! 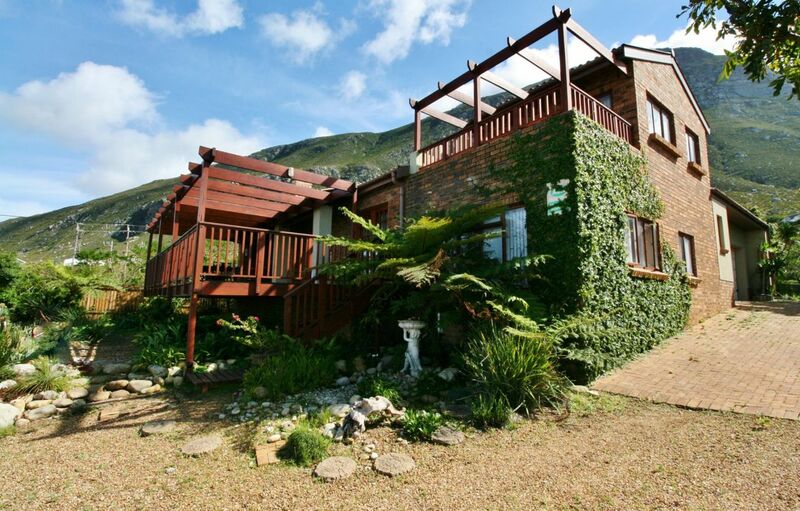 This much loved family home is nestled against a mountain backdrop and towers over Betty’s Bay with gorgeous sunsets over the sea. Feel like a king with you kingdom at your feet. The face brick home is well looked after and offers a lot more than face value. The open plan living area flows into the kitchen and a cozy fireplace in the lounge will certainly warm up cold and windy winter days. The kitchen boasts a four plate gas/electric stove, extractor fan and ample cupboard and storage space. The home boasts four bedrooms and two bathrooms (main en-suite) and all the front rooms have sea and lake views. The fourth bedroom is currently being used as a study. A sunny L- Shaped veranda in the backyard has a built in braai and looks out on the delightful indigenous garden with a full irrigation system housing many species of aloe, cycads, water features and a magnificent mountain view. French doors from the lounge open to the large front covered wooden deck featuring a built in coal stove. With the green belt in front of the house you will always be assured of no buildings obstructing your sea and lake views. More features include alarm system, burglar bars on all open windows and doors, Van Leer solar system, outside shower with hot and cold water, soak away sewer system (French drain), double automated garage and much more. This charming home is definitely worth a view. Ready to move to your next destination? Contact us to arrange a viewing. Greeff – putting the personal back into property.